Nokia's CEO Stephen Elop and its Chief Financial Officer took stage at the Nokia Strategy and Financial Briefing conference and really spilled the beans what exactly will happen with Nokia in great detail. There are a few main points to make note of. First of all, those that bought or will buy Symbian-based handsets needn't worry. The Symbian interface update will be delivered, and, moreover, developers support will continue. There are 1.3 billion Nokia devices in use, and, in areas like Africa and Asia, Nokia sees strong demand for the familiar Symbian platform, and plans to sell at least 150 million more Symbian devices in the years to come, before Nokia Windows Phone takes the torch completely. Stephen Elop chose Windows Phone, rather than Android, because he wanted Nokia to differentiate itself from the pack, and he intends to do so by focusing on great design solutions, and innovative services - from mobile phone payments to new ways of using motion sensors - in order to ensure Nokia Windows Phone will be unlike anything else on the market. The best hardware and design choices like the camera on the Nokia N8, and the keyboard on the Nokia E7 will continue forward in the new Nokia Windows Phone devices. Nokia will use the strategies above to reach "the next billion" of Web users in developing countries, and is doing so through a more streamlined organizational chart, and R&D synergies. The MeeGo team will keep being funded, but now it will be in charge with looking for opportunities to learn and explore future disruptive platforms, devices and experiences. There will be a MeeGo device on the market before end of 2011, which will serve as a playground for trying out cutting-edge innovations. So Nokia has three missions going forward - be the Third Ecosystem in smartphones, reach the next one billion of Web users first, and, last, but not least, to look for the next big disruption in mobile. Each of these objectives will have a separate department in charge of it, with clearly defined responsibilities and targets, as well as direct accountability. 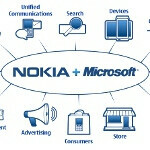 Elop wants Nokia to differentiate themselves from other smartphones? What's wrong with Meego? It's like they didn't even give it a chance. Meego is too risky in Nokia's situation. They need something NOW, and wm7 adoption is a logical move. I would've preferred android, but as they said, wm7 would give them more identity. Android does seem to be too generic. Windows FTW :D Plus I love Nokia. Don't forget about low-end mobile market in asia which account for a huge portion of nokia's sales. These phone can't use WP7. They use the symbian S40 which is specifically design for candybar phones with small screens. Not to mention the E-series with Qwerty keyboard; they need symbian S60. WP7's appeal is it's generous UI realestate and the E and S series can't use WP7. It's probably impossible to fit WP7 into these phones.